Roberta Warshaw Art and Design: The Case of the Curious Mourning Dove! Last weekend the mourning doves came to my feeder. Isn’t this one just the cutest? I love the way he is checking me out. Not afraid at all. Just curious I’d say! Most of my photos of the birds are not that great really. I get the interesting shot but the color and textures are all wrong. They are always too dark or too something (my balcony is on the non-sunny side of the building). Plus with all the snow and gloomy weather it makes it that much darker and harder to get a great shot. Kim Klassen to the rescue! I recently discovered her blog called “Kim Klassen Cafe.” Kim has some wonderful textures that she creates for Photoshop and they make all the difference in the world. Would it be better to be able to do this with the camera alone. Sure. But I am no Steiglitz or Steichen. I have been a graphic designer for over 20 years. But I design textbooks and let’s face it, there is not much opportunity for enhancing photos for textbooks. Other than the occasional silhouetting or removing of logos, (logos are not allowed in textbooks) and sometimes covering up areas of the body that can’t be exposed (we can't have cleavage in textbooks either). That is about it. We rarely add texture to photos. So I hadn't worked too much with texture overlays before. But lately as I get more and more comfortable with my digital camera, I see so many areas for improvement. I love Kim’s textures for helping me improve my digital images! Kim has some wonderful free ones for you to try out here. She also has some easy-to-understand tutorials to get you started using them! Oh, I love your mourning dove. I see how cute she is, too. In Berkeley, California, there is a shop called Tail of the Yak. If you ever have a chance to visit this wonderland, do. 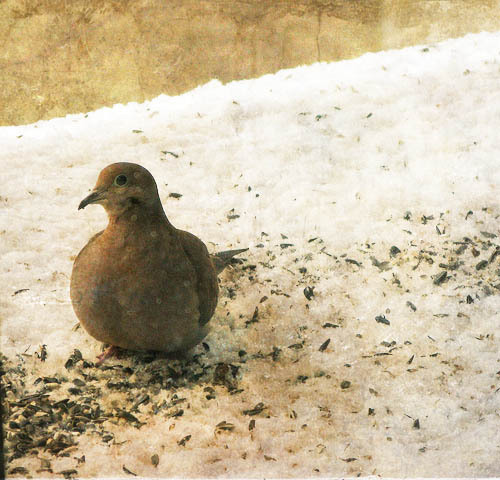 The first time I ever saw a mourning dove was inside of the store. The pair of doves were in a beautiful huge wooden cage high above. I told myself that day that I too wanted some doves. Never happened until I moved here and I have so many you would not believe it. They even have personal ways of being that is adorable. I try to name them. Thanks for the reminder of Kim's site. I haven't been over there for a while. Also, I enjoy you sharing your working experience. It is another insight into what is going on in the world. That's really cute! I especially love their haunting calls that just seem to drift on the breeze on a summer evening. Great image of the mourning dove Roberta & thanks for the link to Kim. Your pic remined me of a MDove that I sheltered years and years ago. She'd been hit and wounded by a hawk ~ I discovered her on my way to my glass studio the morning it occured. She looked at me (you know, the way they do!) and I had to try to save her. For weeks she recovered bit by bit on cracked corn and encouragement. When she was healed & ready to leave she was quite content to stay, lol. She became a bit of a regular and friend around the studio for quite some time. Hadn't thought of her in ages, but seeing the sweet face in your photo reminded me - thankyou!